And, although I am certified foodie (My dad thinks that I was brought to this earth to bring him to financial ruin by asking to be taken out to lunch and dinner REGULARLY...and in not-so-cheap restos at that. My dad even thinks that my desire to travel is brought about by my NEED to eat all sorts of food. ), my talent ends with discerning taste buds, a bottomless pit of a stomach, and a never-ending love affair with food. Bring me to the kitchen and the only use I can be is to wash the dishes (which I love doing!). Hand me a pot or pan and things are sure to get awry. Take it from my sister who claims that I can manage to butcher a simple thing as fried egg. You know those scenes in movies where the annoying career/city girl tries to make something in the kitchen but ends up messing up the place and serving something totally inedible. Well, that's me. Not that I'm proud of this ineptitude of mine. I would love to know how to cook and make versions of whatever Jamie Oliver or Nigella Lawson are wildly concocting, . Or, even a simple 30-minute-meal by Rachel Ray. God knows I'm sick and tired of opening a can of Century Tuna or boiling hot water for my Yakisoba (Spicy Chicken!) whenever I go hungry in the middle of the night or early in the morning. And, I want to be able to host dinner parties with good food, cheese and wine, and themed decors to match. 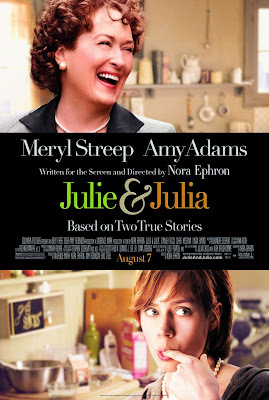 So, after watching "Julie & Julia," inspiration hit me. Why not make a blog...and, on top of that, learn to cook by cooking my way through an entire fail-safe cookbook? I haven't decided on what cookbook to do yet (although the obvious shoo-ins are Jamie Oliver and Nigella Lawson) but I've still got 4 years and change to figure it out. 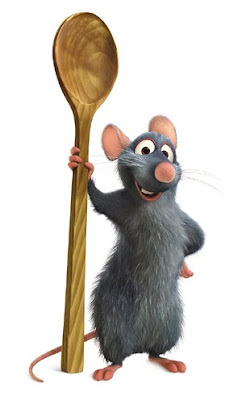 "Anyone can cook"...including this rat. Love the new blog, by the way. Chef of Police! So very witty!